Woolworths' last 200 UK stores have closed their doors for good, leaving more than 27,000 people unemployed. The firm's 807 British outlets have been closing in stages since the end of December following clearance sales. Tuesday was the final day for the remaining 200 stores, following a one-day reprieve by the High Street chain's administrator, Deloitte. 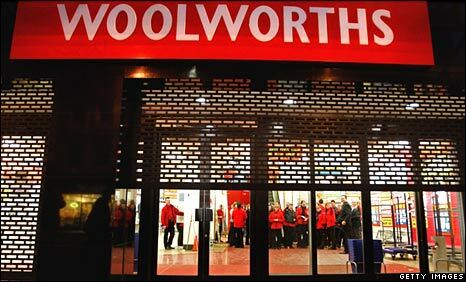 Woolworths went into administration in November with debts of £385m and Deloitte was unable to find a buyer. Deloitte is now continuing negotiations to sell off individual sites, with stores in prime High Street locations expected to be reopened by other businesses. It has held talks with other retailers about taking on the leases of around 300 Woolworths stores and hopes to sell off the Ladybird children's clothes and Chad Valley toys brands. Shopworkers' union Usdaw said it was contacting companies who may be buying empty Woolworths stores, recommending they prioritise applications from the chain's redundant staff. The union said it was also working with other organisations to ensure the staff had the best chance of re-employment. General Secretary John Hannett said: "The union will also be in contact with local colleges, which will be offering free Skills for Life training. "We will be providing as much support as necessary and would recommend all Woolworths staff to use JobCentre Plus and Next Steps to find alternative employment." The store closures follow a clearance sale which saw stock and fixtures and fittings being sold at discount prices. Customers were able to buy items such as staff lockers and the metal baskets they were filling up with bargains. As Glasgow's Argyll Street store closed one shopper said she had picked up bottles of water for 4p, with another saying that despite buying some DVDs and CDs for "pennies" it was a "sad day". Professor Alan Wilson, from the city's Strathclyde Business School, said one reason Woolworths did not survive was because it didn't offer the quality of some other stores. "And it couldn't offer the prices that the discount stores such as Primark, Lidl and others could actually offer," he added. In the Lichfield store Patricia Douglas, 58, said shoppers had squabbled over the final bargains. Mrs Douglas, from Hopwas, Staffordshire, said: "It is so sad to see the shop like this. "Woolworths used to be the heart of Lichfield. It was the heart of every high street. "We are all happy while we are getting the bargains but we won't be so pleased when all the other shops are wiped out too," she added. The administrator would not confirm how much money had been raised by the sale but many stores have been cleared out by shoppers. The chain's first British store was opened by American Frank W Woolworth in Liverpool in 1909. The city's branch shut at midday on Tuesday, as the manager said there was nothing left to sell. Edna Sherman, 62, from Everton, Liverpool, was one of the last customers allowed inside. She said: "People in there are fighting to get at empty shelves, there is nothing left. "I've been shopping at Woolies all my life. I remember going to the pick and mix when I was a girl and lately I would buy clothes for my grandchildren. "There was always a bargain to be had at Woolies, I just don't understand where it all went wrong." Woolworths is the most high-profile UK High Street casualty of the economic downturn and ran into trouble this year after struggling under the weight of its debt.